I’m lucky enough to be going away for a week, which means I will not be posting next week. You may be hearing about my holiday next time I post! 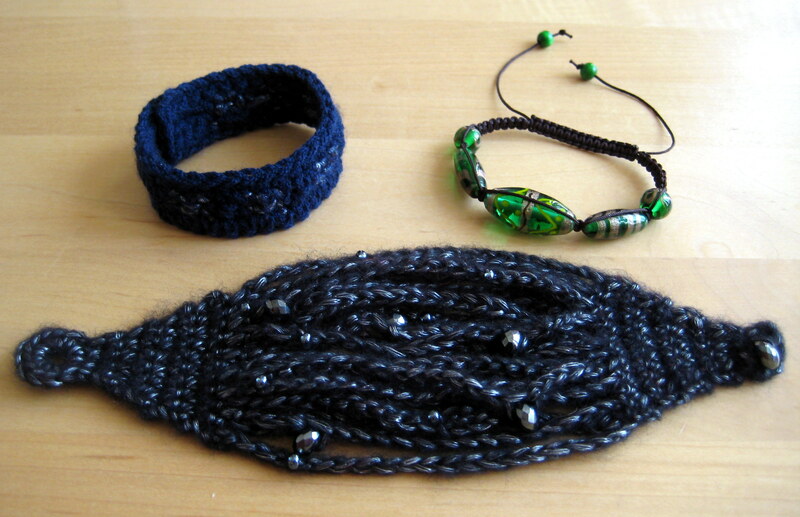 In the meantime here is a quick post about some bracelets I have been busy with this week. As you may be aware I am on a bit of a mission to bust some stash so the multi-yarn one is using up a few odds and ends. I was experimenting with some intarsia, nothing very fancy, but a nice quick project if you have some yarn to use up. Scroll down for the pattern! 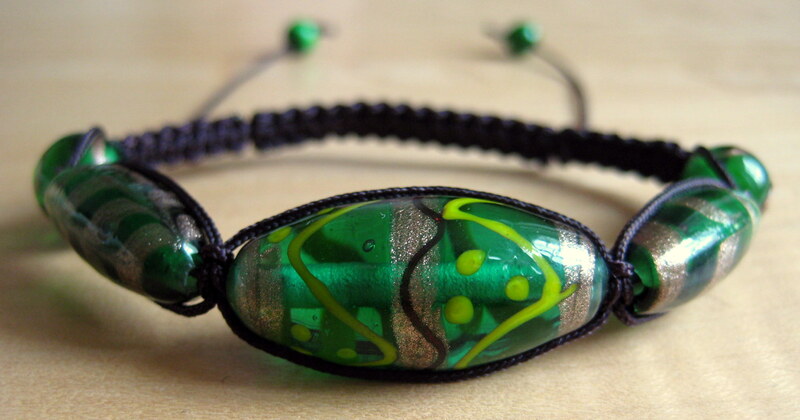 The green beaded bracelet is one of my shamballa bracelets. I previously used these beads on a bracelet for my mum, but it came out too small, so I have recycled them and am giving them back to her! The good thing about these bracelets is they are massively adjustable so I know it will fit this time. 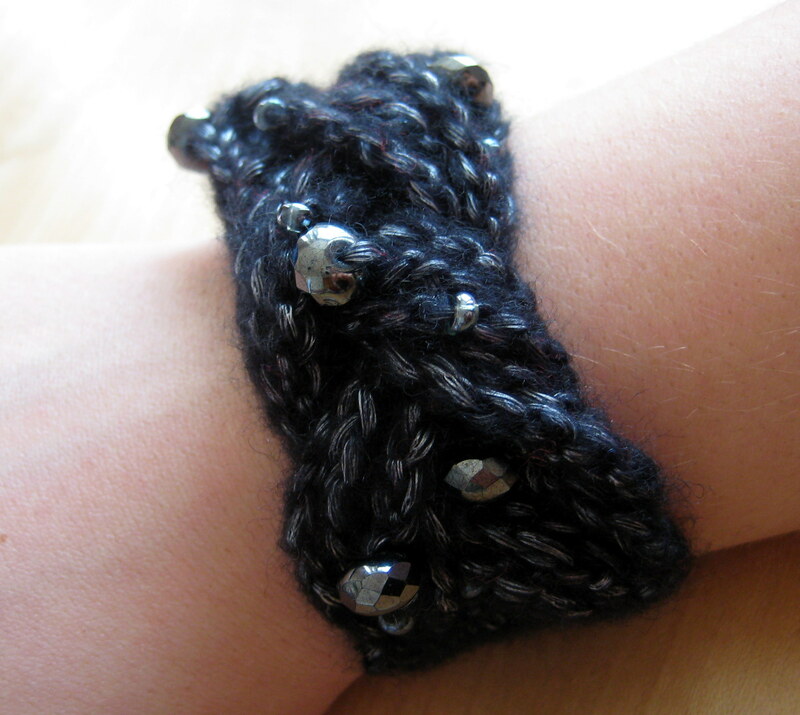 The black beaded bracelet uses up some leftover metallic yarn (it is surprisingly soft as well as sparkly) and uses my beaded crochet bracelet pattern. I like this pattern as it is pretty quick to make and looks different depending on the yarn and beads used. I am thinking of doing a matching necklace, so watch this space! I put in some extra strands to make it chunkier when plaited. You will need two small amounts of dk yarn in complementary or contrasting colours and a size 4mm hook. For R1 I sc’s into the bottom loop of the starting chain leaving the top two loops unworked so that it looked symmetrical when finished, but you can work the sc’s as normal if you find that easier. To switch colours, perform the sc as follows: insert hook, draw up a loop, yarn over in next colour, draw through 2 loops on hook. Do not cut the old yarn, carry it behind the work. This will save a lot of weaving in! 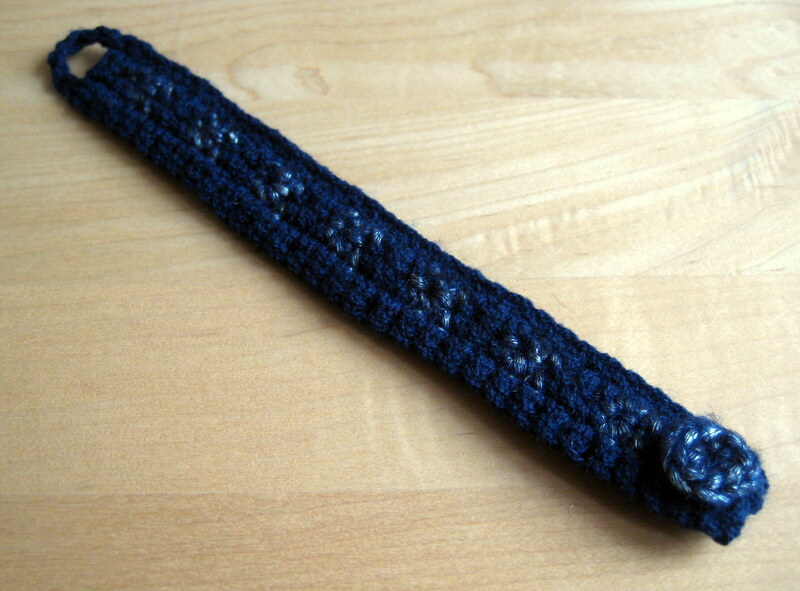 Beginning with your main colour, ch 34 (or more for a larger bracelet). R1: sc in 2nd ch from hook, sc to end, ch 1, turn. R2: 4sc, *switch to 2nd colour, 2sc, switch to main colour, 2sc, repeat from * to end, ch1, turn. R3: sc, switch to 2nd colour, 2sc, switch to main colour, 2sc, repeat from * to end finishing with 2sc in main colour, ch1, turn. R4: sc to end, ch 7 and sl-st into last of foundation ch’s to make a loop for the fastening. To make the fastening disc, either sc6 into a magic ring, pull to close and stitch to the bracelet, or sew on a suitable button or bead instead. Weave in all ends. 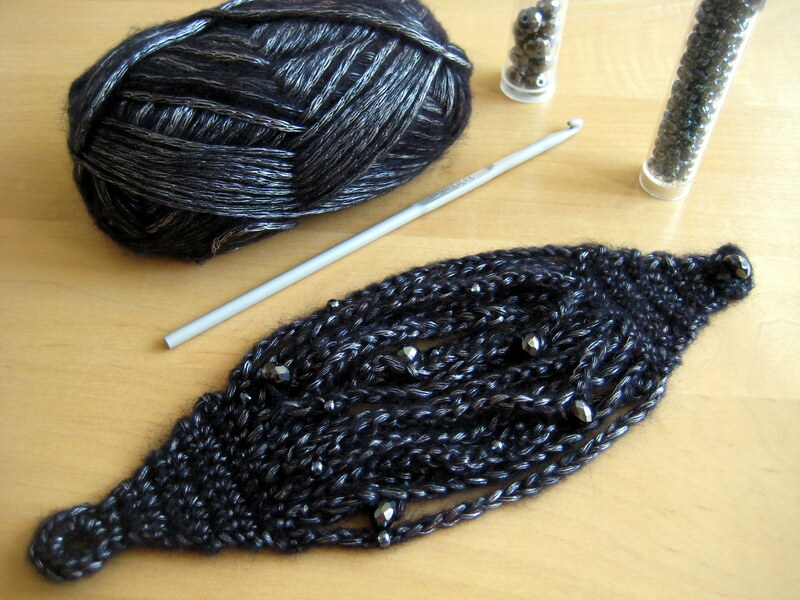 Wow – the black beaded yarn with metallic is *lovely* and I’m coveting the yarn :/ I love grays and shiny things lol ^-^ Thanks for sharing your pattern! Yes – I bought it just cos I liked it then had to figure out what to do with it later! You’re welcome.